Angela Davis Johnson is an award-winning artist who is best known for her vibrant narrative paintings that examine universal connections, identity and historical occurrences through personal symbols. Navigating between academic influences and outsider art individuality, she creates textured figures using paint, scrap paper and fabric within unique compositions. Her practice has extended to outdoor installations that create visibility for marginalized social issues. Davis Johnson’s work has shown in numerous exhibitions including the Delta Exhibition at Arkansas Arts Center in Little Rock, AR, Texarkana Regional Arts Center in Texarkana,TX and Baton Rouge Center for Contemporary Art in Baton Rouge, LA. Her pieces can be seen in galleries and private collections throughout the United States. A wife and mother of two, Davis Johnson lives between Little Rock, AR and Atlanta, GA.
Jessica Caldas is an Atlanta based artist whose work centers around the sharing of people’s stories and connecting those narratives to larger social issues. Primarily a printmaker, she received her BFA in printmaking from the University of Georgia in 2012. Caldas has participated in numerous emerging artist residencies in the city of Atlanta, including the Atlanta Printmakers Studio in 2011, MINT Gallery’s Leap Year Program from 2012-2013, and WonderRoot’s 2013-2014 Walthall Fellowship. She has also been awarded various national and international residencies, including time at The Old Furnace Arts Residency, Blue Mountain Center, and The Emerald Violin’s Backyard Bus. Caldas received the City of Atlanta Office of Cultural Affairs Emerging Artist Award in Visual Arts for 2014 and was a finalist for the Forward Arts Foundations 2014 Emerging Artist Award. Currently unrepresented, she shows work internationally and regularly throughout the city of Atlanta at various galleries and through several public art projects. Vitus Shell’s paintings encompass a depth and intensity usually displayed in the work of artists far past his age. While a student at MCA, the Monroe, La., native traveled and learned more about different cultures and art forms. He attended the National Black Fine Arts Show in 1999 for the first time and received a first hand view of the inner workings of the art world. Other artists he met while at MCA who have continuously inspired him include Brenda Joysmith, George Hunt, and Alonzo Davis. To date, he has accumulated an impressive list of achievements, some of which include: participating in exhibits at universities, museums, and private galleries across the country; painting a mural for the National Civil Rights Museum’s NBA Pioneers exhibit; and being commissioned to do public art by the Memphis UrbanArt Commission. Opportunities for Shell continue to arise for him and he leaves himself open to all they have to offer. He is humble about his bright future, yet poised to become of the greatest artistic “voices” of his generation. 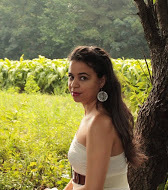 Michelle Ivette Gomez is an independent curator and artist originally from Miami, FL currently based in Baltimore, MD. In 2012, she received her B.F.A. in General Fine Arts with a concentration in Curatorial Studies from the Maryland Institute College of Art (MICA) in Baltimore, MD. Shortly after, she graduated with her M.F.A. in Curatorial Practice from MICA in 2014. She is the recipient of numerous academic awards, including the Jacques and Natasha Gelman Merit Scholarship and Fanny B Thalheimer Merit Scholarship. She is the Founder and Director of Young Blood, an annual exhibition in Miami that showcased alumni from NWSA, has served on the Program Advisory Committee at Maryland Art Place, was a 2013 Latino museum Studies Program Fellow at the S mithsonian Latino Center and Smithsonian Anacostia Community Museum, and most recently was a 2014-2015 fellow of the Urban Arts Leadership Program through the Greater Baltimore Cultural Alliance. Gomez has focused on expanded methods of art presentation and community-focused exhibitions including CONGREGATE art + faith + community and Devociones y Fe (Devotions and Faith). She is currently based in Baltimore, MD where she works collaboratively with under represented audiences to create relevant and accessible art exhibitions and programs about social issues, cultural identity, and community. Born in Detroit, MI and raised in several eclectic neighborhoods in Philadelphia, Muthi Reed’s aesthetic draws its context from the apocalyptic events of their early years— 1980s urban industrial ruin, summers spent in the Black Belt region of Alabama with kinfolk, soul/r&b/rap/hip hop aural immersion since pre-birth, and the influence of crack culture in Philadelphia with family & in public space. Reed documents + remixes narrative and contextual media that explore and manipulate how time, rhythm, body, imagination, memory, and language generate & intersect. Krewe Coumbite: Black Sound Band is Reed’s most recent work. Through deep sound listening & sampling, the aim of a Black Sound Band is to engage past/present/future Black Sense as a living instrument of evo lving engineering, beginning with the formation of a popular Black Consciousness in America during the 1960s. Krewe Coumbite is a MIGRANT sound. Appearing anywhere everywhere Blackness can be found— recordings derive from.. and remixes reflect.. the unique and diverse vernaculars of Black life. Black being understood here as “not a color, but an attitude (James Brown).” Blackness as the site of folk resonance: folk legend, aural extravaganza, fantasy, resistance to imperialism, indigene sovereignty, survival of original ideas against all odds, the expression of all light contradictions simultaneously, super natural, occult love. Black. Jessica Clark’s artwork documents and preserves the everyday life of the Lumbee, and other Southeastern native people. The works are from her perspective and depict the people, places and events specific to her. Georgia; and Blue Gallery and Galerie Pfriem in Lacoste, France. the Savannah College of Art and Design in Lacoste, France. Jessica has also been the recipient of numerous fellowships from the University of North Carolina at Pembroke and the Savannah College of Art and Design. She was named a ‘2014 Woman to Watch’ at the Eighth Annual Conference of American Indian Women of Proud Nations and is profiled in the Winter 2014 issue of First American Art Magazine. Jordan Flaherty is a New Orleans-based filmmaker, journalist, and media activist. He has produced television documentaries and news reports for Al Jazeera, TeleSUR, Democracy Now, and other outlets. His writing has been published in the New York Times, Washington Post, and in several anthologies, including the South End Press books Live From Palestine and What Lies Beneath: Katrina, Race and the State of the Nation. He has appeared as an actor in HBO’s television series Treme, playing himself, and was identified in an Associated Press report as a subject of the New York City Police Department’s spying programs. He is also the author of Floodlines: Community and Resistance From Katrina to the Jena Six. You can see some of his work at jordanflaherty.org. Wow! What an amazing group! Can’t wait to meet and learn from all of them. Congratulations!